It’s been a great few days in Gurim! We spent Friday evening and Saturday enjoying anothe r lovely Shabbat here at Machaneh Yavneh. It was ruach-filled (spirit) and so much fun. After a rousing Havdallah, the kids enjoyed time with the Kerem–Counselors in Training who told them a story before bedtime. On Sunday, the chanichim (campers) went to their new chugim (electives), and it was great to have a change of pace and try something different. 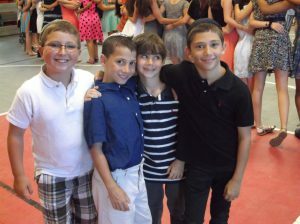 After sha’at menuchah (rest hour), the kids had an shortened afternoon because of the annual Jewish Arts Festival. This year, the Arts Festival was held at Machaneh Yavneh. It is truly an honor when this event is held here. Six other Jewish camps from around the New England area come for the afternoon and evening, and the night is punctuated by rikud and shirah, song and dance. Yavneh’s performance was astonishingly bea utiful, and quite witty, as well. The highlight for Gurim was that a few chanichot from our aydah sang or danced to introduce one of the camps. We were all teary-eyed by the sheer splendor of it all. Yesterday, we hiked Saddleback “Mountain” (see the post from 14 July) and went on a fantastic camp-out in the back field. Check in for more soon!